Interested in climbing on a team? Our training season has begun, but we do have a few spaces available in our 2018-2019 Youth Team Programs. If you have an athlete (ages 8-17 )interested in training twice a week and improving their climbing, send an email to our head coach, jelisa@calgaryclimbing.com and we can arrange an evaluation for your athlete. We have teams for all ages and abilities at each location. Team Evaluations will be on August 31, Sept 1st and Sept 2nd. Alternate days are also available. Registration for Evaluations (Tryouts) is now Open. Link is below. These tryouts will be for all locations and all teams. Team times and descriptions can be found below. REGISTRATION for Youth Team Evaluations. We are excited for the many changes to our Team Program this year. 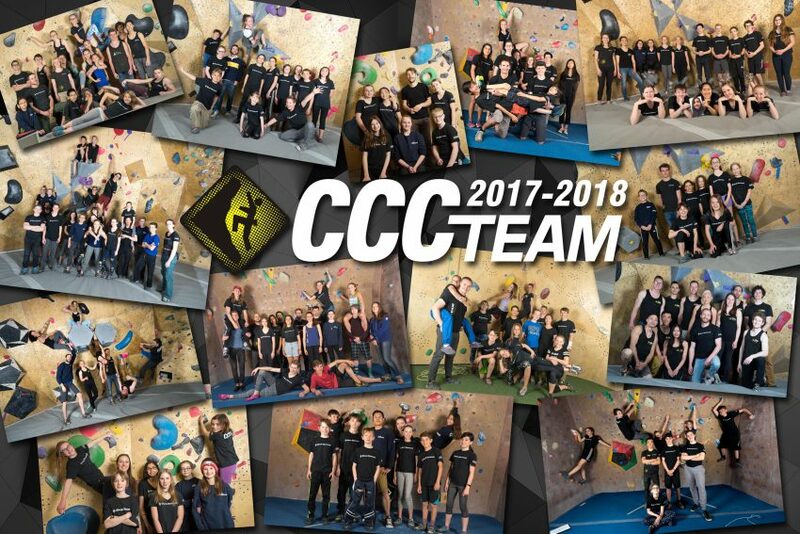 The Calgary Climbing Centre wants to train our athletes to the best of their potential with a Canada-leading program in Bouldering, Routes and Speed. We’ve grown to the point now where our amazing facilities, families and coaches will help create the champions of tomorrow. Head Coach Jelisa Dunbar is BACK and ready to train your butts off! Jelisa is an assistant coach for the Youth National Team and has been climbing and competing at all levels her entire life. She is going to push our athletes and prepare them for local, provincial, national and international comps. Better Team ratios. We’ve dropped our ratio to 8:1 for all teams. And 6 to 1 for the elite groups. Each group of athletes will have a dedicated coach. All teams will now be grouped using the age categories for that year. This will permit us to be more efficient with practices and coaching. –Athletes Born in 2006 or Later, will train together. This group is the Albertan Youth C and Youth D competition categories. They will be competing on age appropriate boulders, top rope routes and modified speed wall. Team names with a #1 at the end are for this age group. –Athletes Born in 2000 to 2005 will train together. This group is the Albertan Youth B, Youth A and Junior competition categories. They will be competing on regular boulders, lead routes and regular speed wall. Team names with a #2 at the end are for this age group. Sport Teams are available at all locations, train in specific age groups and will now have their own exclusive CCC competitions. These will be in-house Fun Scramble type events throughout the year. Two of each style; Boulders, Routes and Speed events to challenge and prepare these athletes for competitions. We’ve also revamped the curriculum of these teams to truly give them an amazing technical base and ability to move confidently on the walls. Development Teams are available at all locations, train in specific age groups and now have a 3rd optional practice time on Saturdays. This will have all Development athletes have the option of climbing/training once a week at the Rocky Mountain Facility. A coach will be present, but the idea is to have the athletes climb for fun and focus on the walls they want. Parents are encouraged to come and hang out. This year, each Development Coach will be supporting their team at all local sanctioned competitions. Performance Teams has an extra training group at the Chinook location and now also have a 4th optional practice time on Sundays at the Rocky Mountain Facility. This will have all the Performance and Elite athletes have the option of climbing/training once a week at the Rocky Mountain Facility. A coach will be present, but the idea is to have the athletes climb for fun and focus on the walls they want. Parents are encouraged to come and hang out. This year, each Performance Coach will be supporting their team at all competitions. Elite Teams will now be training out of the Rocky Mountain location and separated by age groups. This group is moving to a 6 to 1 ratio. They’ll also have an optional 4th practice time on the Sundays where they’ll join the other Elite /Performance groups from the other facilities. A coach will be present, but the idea is to have the athletes climb for fun and focus on the walls they want. Parents are encouraged to come and hang out. Each Elite Coach will be supporting their team at all competitions. Speed Club. In addition to having all teams practice speed climbing during the route season, we are starting a Speed Club. This will be a regular group that trains on the speed wall at CCC Rocky Mountain. We are bringing in one of Canada’s best speed coaches this July to show our coaches how to move, train and coach speed climbing. We want you to be fast. Beep, beep, go! New partnership. We are very excited to announce that we have partnered with Move to Move and they are offering 20% off Physiotherapy Services to all CCC Team members. They will also be working with our youth elite athletes on a weekly basis. They are experts in Movement training, Strength training and Injury prevention. We couldn’t be happier to have them keep an eye on us as our team gets stronger! Check out the schedule for the upcoming season. Our 2018-2019 Youth Team Schedule has seen a complete transformation this year so please take care to read through the material. Our goal was to improve our offerings with better age groupings, improve competition support and add some fun social team time (for parents too). Let us know what you think. If you still have questions after looking over our information please contact Jelisa via jelisa@calgaryclimbing.com. Athletes should try-out for the team they want to be on, but only need to attend one of these sessions to be considered for any and all teams. It’s important to remember that every athlete, regardless of their team, may compete at any event. Format: 3 interviews with different coaches & some bouldering. We’ll have some specific climbing drills to complete. Bring your climbing shoes and chalk bag. Format: 3 interviews with different coaches & some bouldering. Bring your climbing shoes and chalk bag. Alternate Evaluations: Can’t make the regular evaluation night? Sign up for an alternate time if absolutely necessary. Options are August 28th, August 29th or September 4th. Location: CCC Rocky Mountain (R) with occasional practices at other facilities. *Sunday nights are a time for All Elite and Performance teams, athletes and parents to simply enjoy some climbing together. Youth Elite teams are the top competitive climbing teams in Calgary. Elite athletes focus their efforts primarily on the competitive season and participate in both individual and group targeted training. Elite team covers intense training cycles that fine tune the athletes’ physical, mental, technical and tactical abilities. Athletes selected to Elite team are motivated to compete, train, and improve all facets of their climbing. They are disciplined and focused and uphold great professionalism and sportsmanship during team training and competition. Athletes are expected to attend all team practices and work hard for themselves and their fellow team mates. We have partnered with Move to Move (Fitness and Physiotherapy) to offer weekly movement training, strength training and injury prevention to help these athletes stay healthy, balanced and push their limits. These will be weekly sessions immediately after Saturday Training. **Sunday nights are a time for ALL Elite and Performance teams, athletes and parents to simply enjoy some climbing together. Youth performance team is for advanced climbers who are committed to training hard and pushing their limits. This team blends both competitive and performance climbing, allowing the athlete to focus on what motivates and inspires them to be the best that they can be. Performance team focuses on recruiting technical, tactical, physical and mental skills that drive athletic performance. Athletes selected to Performance team demonstrate focus and discipline and are committed to attaining their personal best. They are motivated to train and to improve all facets of their climbing. Performance athletes uphold great professionalism and sportsmanship during team training and competition. Athletes are expected to attend all team practices and work hard for themselves and their fellow team mates. **Saturday climbing is a time for ALL Development teams, athletes and parents to simply enjoy some climbing together. Athletes selected to Development team are motivated, focused and driven to improve all facets of their climbing and embrace new challenges. They have an intermediate understanding of sequencing, technique, movement, and problem solving. Development athletes are supportive of their team mates and respectful of our facilities, coaches and programs. They demonstrate sportsmanship during training and competitions. Athletes should be prepared to attend all practices and work hard for themselves and fellow team mates. Sport team is for new and experienced climbers who are looking to improve their climbing, be a part of a team environment and push their personal limits. Sport training focuses primarily on building a strong foundation of technique and movement in climbing before introducing more advanced training and techniques. Strength and conditioning cycles are introduced to supplement athletic development and push climbers to new physical limits. -Experienced climbers who wish to pursue rock climbing in a recreational environment that challenges their limits and supports their goals, creating climbers for life. -Experienced climbers who wish to pursue climbing competitively but require more foundational training and skill building before advancing to a higher-level team. -New climbers who are entering our sport in the teenage years and looking for a challenging environment to bring them up to speed technically, physically and mentally to pursue their current and future climbing goals. Climbers selected to Sport teams are focused, motivated and driven to improve all facets of their climbing and embrace new challenges. They are supportive of their team mates and respectful of our facilities, coaches and programs. Climbers are expected to show up prepared to practice and work hard for themselves and their fellow team mates. Sport Teams will be participating in our own in-house competition events. We have created a Sport Cup Series to challenge and motivate our athletes in a fun and supportive format. These are exclusive to the CCC and will teach your athletes how to enjoy and perform while they push and climb at their limits during all future competitions. We’ve got 2 bouldering, 2 routes and 2 speed events planned.